What if I don’t have my ID with me? How many bikes are available? What if there are no more bikes available? Campus Recreation offers a Bike Share Program that will allow students without reliable transportation to increase mobility around town. Students can ease car traffic around Hilo, promote physical fitness, and help decrease our dependence on carbon emissions! Borrowing a bike is simple, and we encourage all Vulcans to test-ride our bikes for your short errands. 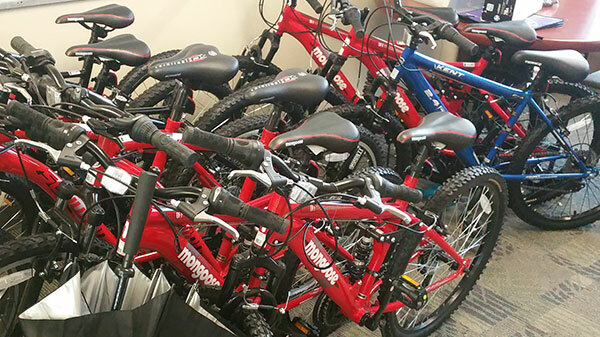 You can check-in & check-out bikes whenever the Student Life Center front desk is open. Monday-Friday, 8:00 AM - 4:30 PM. Register for the Bike Share Program online for free. You need to be at least 18 years and older and only need to do this once per academic year. Come to Campus Recreation front desk, located in the Student Life Center. We'll give you your bike number, key to the lock, a front and rear lights, and a card indicating you're registered through our program. Upon return, all items need to be returned or you will receive a strike. Conduct a safety check on the bike to make sure it's in good working order. Have a safe ride around town. Check out the safety guidelines from the County of Hawaiʻi or visit the Student Life Center front desk to see a bigger poster with information. Bikes are due back by 11:00 AM the following business day. If they are borrowed on a Friday, bikes are allowed to be out for the weekend, and must be returned the following business day at 11:00 AM. When you return the bike, park and securely lock it at the bike rack where you picked it up (next to the Student Services Center), and head inside to the Student Life Center front desk. One of our staff members will then check it back in. The bike must be returned in good working condition. All bicycle loans last for one business day and must be returned after that time period. Bicycles can be renewed in the event that there is no students on the waitlist for the Bike Share Program. You will need to revisit the Student Life Center to rent the bike out. After a three (3) day continuous rental period, students must wait one day before re-renting a bike. This includes renting over the weekend (rented out on Friday and returned Monday). On the 3rd day or day of return and you'd like to re-rent the bike, we will put your name on the daily waitlist and if a bike is available at 3:30pm we will call/email if you are still interested. This allows others to make use of our popular program. Our bikes will take a brief winter vacation from Thursday December 7 - January 14, 2019 for routine maintenance. If you notice any problems with the bike during your reservation, please let our staff know so we can get it fixed. We do not provide a helmet. It is recommended that all riders wear a helmet, so we strongly suggest you bring your own. You can buy a helmet at the Hilo Bike Hub , Mid-Pacific Wheels , or any large retailer that carries bicycles (Wal-Mart, Target, etc). Unfortunately, you will not be able to check out a bike. We only accept UH Hilo Validated Student IDs. Even if you have other forms of ID, it's the UH Hilo ID that verifies you as a current student, faculty, or staff. No Validated UH Hilo ID = No Bike. We have a limited amount of bikes available. 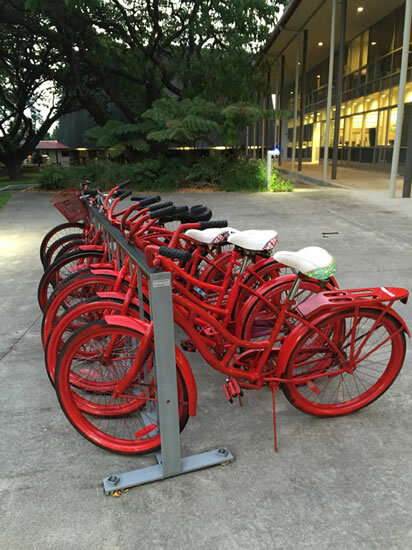 With your kōkua we are able to rent the bikes out consistently and be able to maintain any repairs for future bike-share riders. 10 new bikes were added to the bike share inventory in Fall, 2017. Thank you to the Division of Student Affairs and University of Hawaiʻi at Hilo Student Association (UHHSA) for supporting the program! If a bike is rented out Monday - Thursday, the rented bike is due at 11:00AM the bext business day. If a bike is rented out on Friday, the bike is due at 11:00AM Monday. If there is a holiday during the week, the Student Life Center worker will let you know when the bike is due back. If the bike is not returned by the return time, the "Three Strike Policy" will begin to take affect. Warning: After the first time that a bike and/or it's equipment is not returned on time, you will be issued a warning. A warning may also be issued if it is discovered that you have not properly locked the bike issued to you. Strike 1: After the second time that a bike and/or it's equipment is not returned on time, you will not be able to borrow a bike for 1 week and will be issued a first strike. A first strike may also be issued if it is discovered that you have not properly locked the bike issued to you a second time. Strike 2: After the third time that a bike and/or it's equipment is not returned on time, you will not be able to borrow a bike for 1 month and will be issued a second strike. You will also receive an automatic strike 2 if the bike comes back damaged or equipment is missing and be held to a financial obligation until repairs or replacements have been completed. A second strike may also be issued if it is discovered that you have not properly locked the bike issued to you for the third time. Strike 3: After the fourth time that a bike and/or it's equipment is not returned on time, you will not be able to borrow a bike until the next academic year and be held to a financial obligation until return. A third strike may also be issued if it is discovered that you have not properly locked the bike issued to you for the fourth time. Note: Regular wear and tear such as a popped tire, scratches, etc., will not be charged but you must report any issues. If you do have a popped tire, it will be your responsibility to return the bike to the Student Life Center front desk. You must immediately report lost or stolen bikes. Bike - $150-$550 *we've purchased bikes for long lasting quality. Please be respectful and responsible for our bikes. Bikes are checked out on a first-come-first-serve system and we do not take reservations. If all of the bikes are checked out, you will have the option to be put onto a waiting list if you choose to wait for a bike. We'll contact you once a bike gets returned and is available for you. Note: The wait list is only valid for that day and is cleared at the end of the day. If biking at night, you must use the provided lights. If you get a ticket, you will need to pay for it. Follow the rules of the road, read the road signs, and stay alert. Bikes should be locked securely through the front tires then the bike frame and finally to a bicycle rack. Bikes should never be locked or chained to roadway signposts, parking meters, or railing. Review the safety guidelines from the County of Hawaiʻi or visit the Student Life Center front desk to see a bigger poster with information.